In February 1973, a minyan came together in defiance of the prevailing belief that it was impossible to be both deeply Jewish and proudly gay. The community that grew from that inspiration became Congregation Beit Simchat Torah. This Friday, February 8, 6:30 pm, we celebrate the 46th Anniversary Shabbat and another milestone: This will be the 25th anniversary of Joyce Rosenzweig's first service with Rabbi Kleinbaum at CBST. 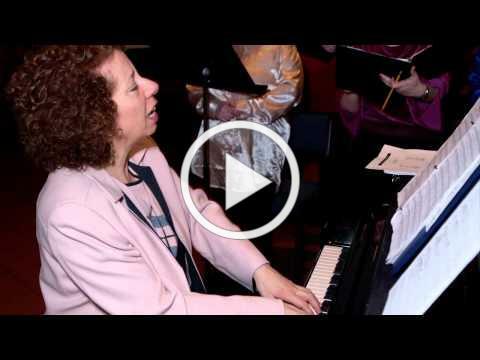 The participation of the chorus (representatives of all the minyanim) was limited in 1994, but over the years as CBST's Music Director, Joyce developed our chorus into a core component of Shabbat and holiday observances. Rabbi Kleinbaum drew Joyce to CBST and that collaboration has drawn thousands to CBST. Enjoy this video created in celebration of Joyce's 16th anniversary at CBST. You may purchase the 2013 "Return Again" High Holy Days CD and/or "Shabbat Shira 2003 / CBST 30th Anniversary Psalms CD" with CBST Community Chorus and guest artists, directed by Joyce Rosenzweig, Music Director online HERE or at the CBST office during business hours. You may sponsor the Oneg with a brief tribute (deadline is Thurs. Feb. 7, Noon) to be printed in the Shabbat Program on Friday. See you on Friday for a glorious, celebratory Shabbat!